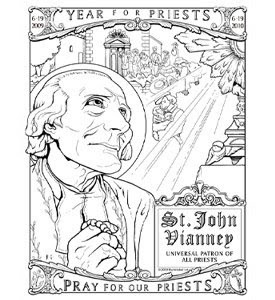 Shower of Roses: The Year for Priests Coloring Contest!! My children have been asking for some time when Illuminated Ink would be having another coloring contest. Well, according to their July news-eLetter they are having one right now in honor of the Year for Priests! Here is the link for all the details and to download the coloring page. Good luck! Thanks for the info., Jessica. I will check out that coloring contest! Yes, I do make the other children redeem tickets too, if they would like to watch the movie as well. Some choose to, and others do not. However, when we went to see a movie on Tuesday (which was going to be 8 tickets each) the girls only had 4 for I left it up to the boys if they wanted to loan the girls tickets which they did. They REALLY wanted to go. I have also had to find a few easier ways for my daughters to earn tickets... I've given them tasks like putting a puzzle together etc. I hope that helps! Yes, that helps. Thank you, Jessica!